If you want a more savory soup replace the carrot juice with vegetable stock. Heat olive oil in a soup pot and add onions and celery. Cook till the onions have softened and add in the potatoes and carrots. Let these cook till the vegetables have browned edges. [Browned bits are where the flavor is at.] Add in the garlic, dill and thyme and mix well. Deglaze the bottom of the pot with the wine and allow a few minutes for the alcohol to evaporate off. Add in the carrot juice and one cup of vegetable stock. Cover and cook for half an hour or so, until the vegetables are fork tender. Remove the bay leaves and thyme stems. Transfer the soup to a blender and blitz till smooth. [Remember that hot liquids will expand when blended so do not fill the blender more than half-way and cover the top with a kitchen towel while holding down the lid.] Adjust the consistency with vegetable stock and taste to see if salt and pepper are needed. 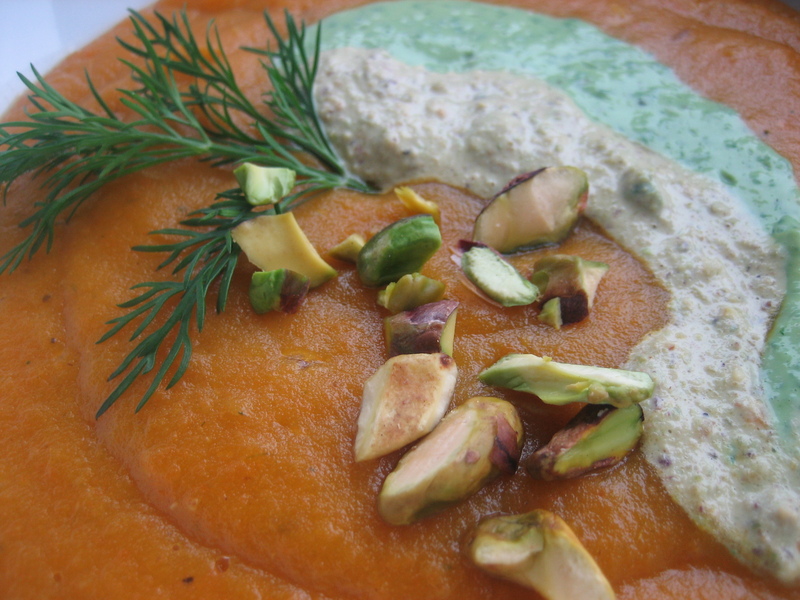 Spoon some of the sweet pistachio cream and tart creamy dill sauce over the soup and garnish with chopped pistachios for a nice crunchy contrast to the silky soup. You can adjust the tartness of this sauce by adding either more of less vinegar. The vinegar I used has a very distinct flavor though as a common substitute I would likely choose an apple cider vinegar. Simply blend all ingredients in a food processor. Toss into a processor and blend. Thanks for the recipe! That’s for dinner tonight!